Inflatable 3-D Hello Kitty space jump. 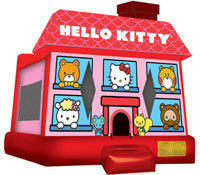 Your little girl will enjoy the unique design and style when she arrives to her birthday party to see this Hello Kitty 3D bouncy house. It offers ample jumping area.